This recipe really brings back childhood memories. Adding oatmeal to the meat mixture helps it tastes just like meatloaf and makes this recipe easy on the budget. 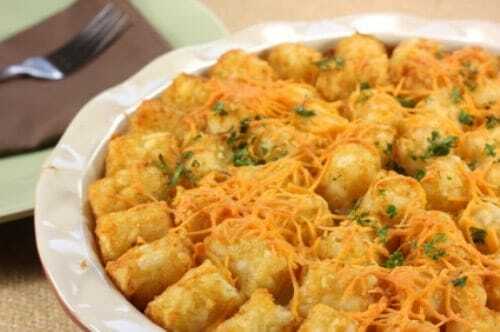 This meatloaf tater tot casserole is a great way to enjoy tater tots. Combine first six ingredients and mix well, add hamburger. Put in a 9" by 13" baking pan, top with tator tots and Cheddar Cheese Soup. Bake at 350 degrees for 1 hour. There is 4500-5000 mg. of sodium in this recipe without the salt & onion salt. Linda your version sounds like a great recipe. I would like to give this one a try soon. This was ok….soup was hard to spread around the tater tots…meat didn’t have much flavor. Not sure I would make this again. my kids would love this..gotta try it!And i may add some kind of veggie to the meat and there you go..